SCVHistory.com TLP1703 | Tataviam Culture | Louis Gonzalez Garcia: WWI and WWII Draft Registration Cards. World War I and World War II draft (Selective Service) registration cards for Louis Gonzalez Garcia, who served in the U.S. Army from April 25, 1918, to June 30, 1919. Louis was a son of Espidon (Epididon) Garcia and California native Caroline Ochoga. Dated June 5, 1917, his WWI registration card shows him living in San Fernando and working as a ranch hand for George Buckley of Castaic. Note that he hand-signed his middle name with a terminal "z." Shortly after his discharge from the Army, Louis married Mary Cooke of Castaic on Sept. 5, 1919, in Newhall. Mary was a daughter of Fred and Francis Cooke; on her mother's side, Mary's ancestry traces to individuals living in the Tataviam Indian village of Chaguayabit (Tsawayung) at Castaic Junction prior to European contact in 1769. On her father's side, Mary's father's father's mother was a California Indian born at the Mission San Gabriel. Mary would become the matriarch of the Cooke and Garcia families of the Santa Clarita and San Fernando valleys. 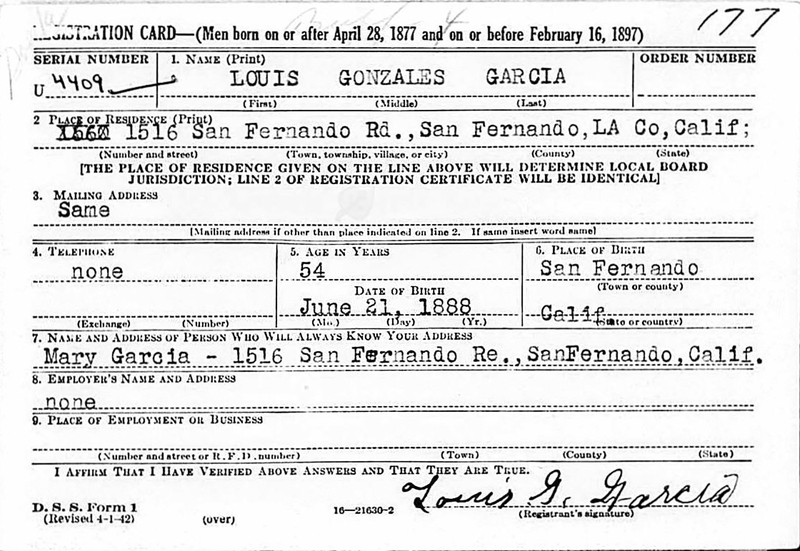 Louis' WWII registration card, dated Nov. 16, 1942, shows his middle name as "Gonzales," but Louis didn't spell out his middle name when he signed the card. 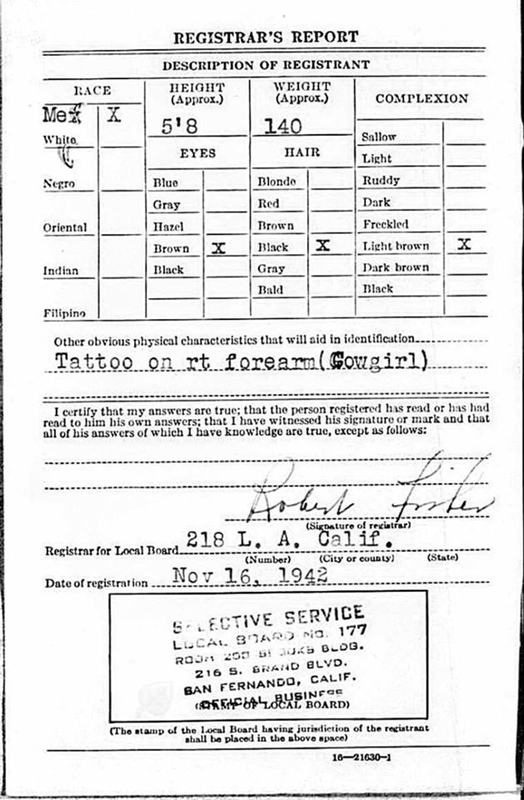 It shows his race as "Mexican" states he had a tattoo on his right forearm (which is correct, according to family members), and shows that he and wife Mary lived at 1516 San Fernando Road in the city of San Fernando. No employement information is provided. 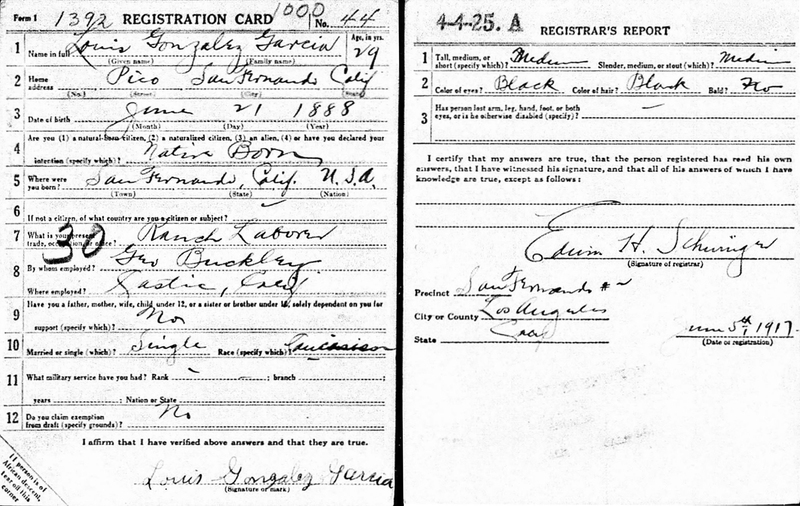 Both registration cards give a birth date of June 21, 1888, but this information is suspect. According to great-granddaughter Kathy Villa, family tradition says he was born June 21, 1885; this date appears in his wife's (Mary's) Bible that has been handed down, and 1885 is consistent with records in the Social Security Death Index and the California Death Index. TLP1703: 9600 dpi jpegs courtesy of Tricia Lemon Putnam.